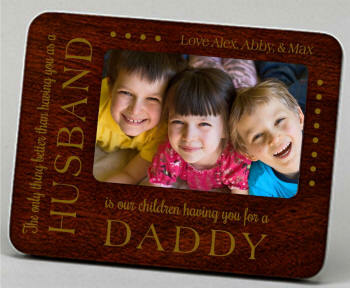 This Bangor wood photo frame comes in a dark brown finish and holds a 4" x 6" photo with a photo exposure size of 3.75" x 5.75". The frame has a 2 way easel so it can stand horizontally or vertically but the best feature of this frame may be the extra oversized engraving area. Overall the frame measures 8.75" x 6.75" x.625". Laser engravable (available but not included). Boxed.